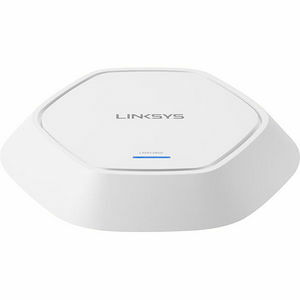 Eliminate bandwidth bottlenecks and streamline management in your office with the Linksys Business Pro Series Wireless AC2600 Dual-Band MU-MIMO Access Point (LAPAC2600). Ideal for high-density WLAN environments, the access point keeps your small to medium business running smoothly with combined speeds of up to 2.53 Gbps. It also greatly simplifies administration with its Clustering feature that lets you manage multiple access points from a single point of control. The LAPAC2600 Access Point uses MU-MIMO (Multi-User, Multiple-Input, Multiple-Output) technology to ensure multiple simultaneous connections. MU-MIMO provides a dedicated data stream for each connected client, so your employees won't have to compete with one another for bandwidth. Multiple users will be able to simultaneously engage in video conferencing, download large files, and perform other data-intensive tasks with minimal or no latency on their devices. Featuring support for 802.11r and 802.11k standards, the LAPAC2600 Access Point allows 802.11r-enabled client devices to roam seamlessly between access points. Your employees will be able to move freely across the office while conducting VoIP or video calls--without any interruptions due to dropped packets or missed handovers. The LAPAC2600 Access Point excels as a standalone access point and as a component of a larger wireless distribution system (WDS). It can also be used as a workgroup bridge to extend the range of your wireless coverage.